This entry was posted in Blu-Ray, June, Months, October, Theater and tagged alien, aliens, blu-ray, june, logan marshall-green, michael fassbender, movies, noomi rapace, october, prometheus, ridley scott, theater. Bookmark the permalink. “crying davids” – awesome! This needed more OOMPH than symphony… like they promised us in the ADs! I think this movie, more than anything else, is a victim of the complete bombardment of advertising before the film hit. Not only did it push people’s expectations too high but it created a world (no pun intended) that the film just didn’t satisfy. I’m with you, Andy, this is a tough one to take a firm stance on. It has a LOT going for it, most notably its incredible production values and visual effects. And at times the story is really really ambitious, and that should be appluaded. But youre right to point out that all the questions it raises arent necessarily good ones, and there’s also character issues, as you also note. Honestly, I have been dreading writing this one since I saw it 2 weeks ago. It’s the main reason I’m so far behind in my writing. Now that it’s done I’m just relieved! 4 is too high. I gave it 3 in my review. This was supposed to be an Alien prequel, but it appears they went too far back. It just didn’t tie in the way it should have. Great review and I’m glad to see someone else struggling with it as well. After seeing it I think part of the reason the marketing totally backed off the Alien thing was because the film doesn’t really provide concrete info for Alien even if it was meant to. That’s one of the reasons I really think there will be a Prometheus trilogy that hopefully connects the dots in a more meaningful way. There’s a longer version supposed to come out when it hits DVD. I hope that clears up some of the confusion. I know big chunks were cut out in spots. Yeah, I’m not sure an extra ~30 minutes will change too much but I’m hopeful it will at least flesh out the characters a bit more. I’m probably going to buy the Blu-Ray regardless, though. Pure rental for me. I wanted to own this one until I saw it. I think one more viewing is all I need. Totally understand that. Maybe I’m just hopeful that I’ll experience more of it the more I watch it. Probably a terrible expectation for me to have, though. Prometheus was not supposed to be an Alien prequel, as Ridley Scott stated long before its release. He was originally working on an Alien prequel, but made Prometheus instead. I have heard both sides of the “is it or isn’t it a prequel” debate. Scott could have not wanted to spill the beans that he was looking at a sequel, he may not have wanted to get hopes up about tying both films wholly together…I don’t know. Scott may have also seen Prometheus as a perfect tie-in to what he had planned for the Alien prequel, we’ll really never know (unless he talks about this point on the Blu-Ray). Scott has also waffled about the identity of Deckard in Blade Runner. I take what he says when discussing his movies with a truckload of salt grains. I’d give it 5/5. Loved it, as you know. Like you, I had to take time with my review so that I didn’t give away spoilers. This is my #1 of 2012, but that’s without having seen some of the most acclaimed films: Coriolanus, Haywire, Moonrise Kingdom — I’ll try to see all of those at some point. Hopefully this summer for Haywire and within the next few months for Moonrise Kingdom. Not sure about Coriolanus. ANYWAYY…great review. I think Cabin in the Woods is my top 2012 pick so far but, like you, I have yet to see any of the films you listed…and Dark Knight Rises is just around the corner too! My opinion is similar to yours. I really can’t come up with a solid rating for it. I liked Scott’s direction and Michael Fassbender’s character, but felt Rapace’s character was too two dimensional. I liked many parts of it, but disliked others. Good review. I’m still not totally satisfied with my rating and I’m almost positive that if I ever revisit old reviews later on, this will be a score I change. i forgot to mention the awful make-up job on the old guy. c’mon, hollywood. don’t you have any elderly actors you could have wheeled out? gary marshall’s looking pretty old, isn’t he? they could have saved a lot of money on all that silly putty that was plastered all over that guy’s face. and his physical movements were not at all convincing. you could see he was an average guy trying to move as if he were old. Yeah, I laughed out loud when he came on screen. I read somewhere that Guy Pearce was used because they wanted to have some scene(s) with Weyland as a younger man and by the time those scenes got axed, Pearce was already cast. Still seems incredibly silly to me. If Pearce had used an Australian accent,he would have been Rupert Murdoch, instead he went for a Richard Attenborough in Jurassic Park! I believe he is supposed to look ludicrously wrinkled and old. Just having an old actor wouldn’t give the proper feeling. I’m still completely obsessed with this film…several weeks after seeing it. I can see why some people wouldn’t like it though. David’s entire character confuses me, but in a good way. His childlike wonder upon entering the structure makes me wonder if he ended up acting on his own rather than by his instructions. He seems like he is curious about things and is simply testing what will happen. I can’t be sure, though. Good review Andy. I thought that this film looked beautiful and had some real moments of tension and suspense, but they were very far from each other and the story just never fully lifted off for me. Also, the characters weren’t people that I could really care about either, with the exception of David who seemed like a character that was going to do something extraordinary in the end, but instead, ehhh…I won’t say. I loved David but his intentions are still almost totally unclear to me. At first I assumed he was acting on some sort of direct orders from Weyland but then it seems like he was acting like a curious child. Upon a rewatch I will be following his character very closely to see if I can understand more. I totally agree about the other characters, though. I was really quite harsh with my review and, to be honest, it probably wasn’t as bad as i made out. I just felt Scott couldn’t decide whether to make it an Alien prequel or not and shoehorned some of the stuff in there to get people to watch it. I’m hoping any subsequent films flesh out the ideas introduced in this one, which will hopefully allow people to look upon it a little more favourably. Nice review! I like the poster! This film is the summer’s smartest blockbuster thus far. I like finding posters that aren’t the same posters you see everywhere. I would agree that it’s the smartest blockbuster but given the films I’ve seen for the summer so far, it’s not much of a bragging point. I dug it a lot. But I was the same as you. I dwelled on the film for a few days before writing my review. In the end, I decided I really dug it. I know I did after walking out of the theater. I suppose when the blu-ray releases I will have a better opinion. I will see if it holds up to multiple viewings. I am sticking to my guns and saying this movie has almost nothing to do with being an Alien prequel and is everything to do with advancing the, oh, I wouldn’t want to use the big “C” word, but let’s just say “alternate” theory that humans are descended from alien experiments, as described best in the Area 51 series of books, as described in my review of this movie. Anyone who somehow got the misleading idea this was an Alien prequel would rightly be disappointed, but it’s so much more, and so much better for it, I feel. Interesting point. I have not read those books but I was reading that post on your blog so I’m curious about them. If there are more movies in this Prometheus series, it will be interesting to see if they try to push more info “Alien prequel” territory or continue to skirt it. That will be interesting to follow indeed. It wouldn’t be impossible to do both, tying in the Alien story as a subplot/tangent to the larger picture. In fact, that wouldn’t surprise me at all, but whether or not we’ll ever see these films or just continue to dream of them remains to be seen! I sincerely hope we aren’t just dreaming here and everyone involved sees the benefit (is it too hyperbolic to say “need”?) for a Prometheus trilogy. I still find myself thinking about the happenings in Prometheus so I can genuinely say I’m looking forward to the Blu-Ray release. were underdeveloped while the actors who portrayed them were stellar. It’s a beautiful film, though (visually, I mean). I think I need to see it again now that all my presumptions are gone and see what I REALLY think about it. I think I liked more about it than not, though. These days I see very few films in the theater, but this was one I made it a point to catch, and although I liked it more wholeheartedly than you did, I agree that it had too many characters and, perhaps, too many unanswered questions. The former problem just demonstrates how good the original ALIEN is, with a crew about half the size that you got to know about twice as well. But I’ve always prized the fact that the films in the ALIEN series (and I’m speaking of the actual tetralogy–don’t know if “quadrilogy” is really a word–without the AVP knockoffs) are so different from one another, and while this film’s ALIEN patrimony is debatable, they succeeded in that respect here as well, even with the original director. My understanding is that they wanted to hedge their bets on calling it an ALIEN prequel so that they could, in effect, have their cake and eat it too by making sequels to PROMETHEUS while not being bound (ha ha) to the original mythology. Given the points of comparison, it seems ludicrous NOT to think of PROMETHEUS as at least some kind of prequel, but if they’re hoping to launch a new series as well, I’ve begun referring to this film as a “preboot.” In the final analysis, I think it’s a mistake to get too bogged down in “is it or isn’t it?” semantics and remind ourselves, as I constantly did while I was watching the film, of all the ways in which it could have gone wrong but didn’t. And my tolerance for those unanswered questions is higher if they may be explored in one or more sequels. Didn’t know about the longer version coming on DVD. When I went into the theater I had the open view to NOT view Prometheus as an Alien prequel but I kept my eyes open for ties to that series. My tolerance for ambiguity and unanswered questions is also higher with the hope there are sequels. I also really like the term “preboot”. That’s a very good review, Andy, because it properly mirrors your uncertainty about ‘Prometheus’ in the same way I’m seeing from a lot of other folk who’ve watched it, myself included. At the moment I’m sticking to 3.5 out of 5, at least until I’ve seen the blu-ray. The worrying thing is, I went back to see it a second time and I didn’t get anything more from the experience – I absorbed the visuals a bit better, that’s all. Like you, I also went in fully conditioned to seeing a new Sci-Fi film from Scott, not necessarily an ‘Alien’ prequel. I think that helped. The lightly sketched characters didn’t bother me too much (‘Alien’ did the same thing) but yeh, I think a couple of them could’ve done with a little more back story. On the whole, it’s not a problem. As you say, ‘Prometheus’ suffered from the expectation more than anything. I hope the story branches out & gets further away from ‘Alien’, not closer. 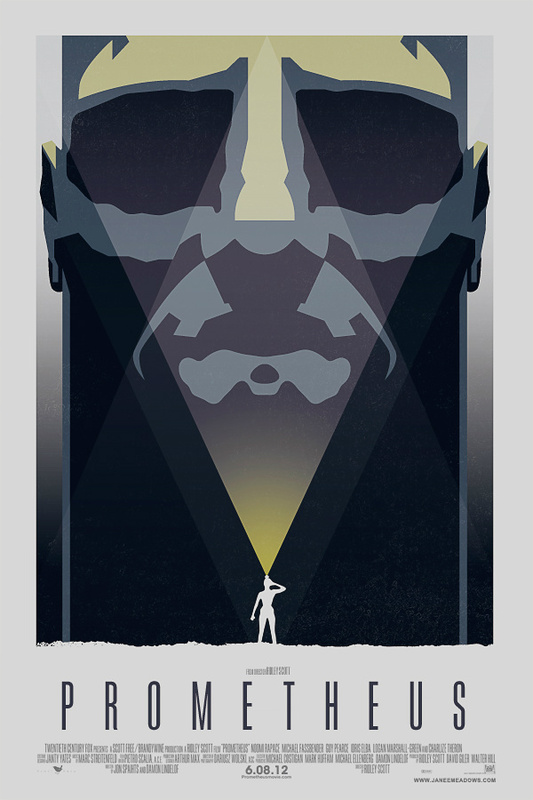 They can tie it into ‘Alien’ at the end but I think ‘Prometheus’ can go its own way till then. Thanks much, glad you agree! It is a bit troubling about not getting more out of it a second time through, though. I’m hoping the Blu-Ray expands on enough of it to flesh some things out but I don’t necessarily think it will make a hugely better experience. I’d be fine with Prometheus becoming its own series that just happens to be in the same world as Alien with cursory events. The more they try to connect the two, the more it will likely stir the preconceptions of fans. Finally everyone can see we aliens created humans! We’re not all bad! Would love to see it on BluRay. It’s one of my favorites of the year as well, I think. You should definitely try to catch it on blu-ray! I love Andy’s reviews, and Netflix is finally coughing up Prometheus to me tomorrow. Of the reviews I’ve read, I noticed the one (and many times the single) criticism of the film is the character’s frustrating decision-making. Several friends of mine agree that it improves on repeated viewings. For me, that’s a big positive. Enjoy these two thoughtful looks at Prometheus from Andy!